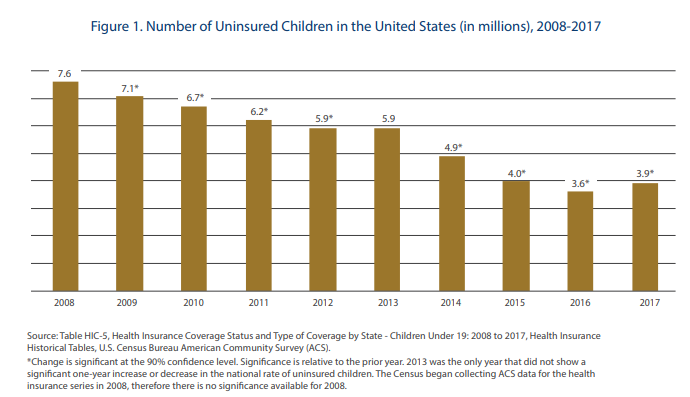 Four-thousand more children were uninsured in 2017, as the number of children without health insurance coverage nationally increased for the first time in a decade. Four-thousand more children in North Carolina went uninsured in 2017 than in the previous year. That's as the number of children around the country without health insurance went up for the first time in a decade, according to a recent analysis from the Georgetown University Health Policy Institute. The uninsured rate among children around the country had been decreasing for many years. Joan Alker, one of two researchers behind the analysis, attributed that to "bipartisan efforts to extend coverage through Medicaid and the Children's Health Insurance Program (CHIP)." Alker writes that the recent uptick in the uninsured rate for kids may be a result of Congress and the Trump administration's efforts in 2017 to roll back the Affordable Care Act and make cuts to Medicaid. From 2016 to 2017, Alker and her co-author, Olivia Pham, found that not one state improved its rate of children's health insurance coverage, with the exception of the District of Columbia. Three quarters of the kids who lost coverage lived in states that had not expanded Medicaid, including North Carolina. In this state, nearly 5 percent of children lacked health insurance in 2017. The report's authors emphasized the importance of health insurance coverage in securing regular doctor visits and access to medications for children. They wrote that public coverage is associated with improved educational outcomes, and long-term health and economic gains. An annual report on the well-being of children in North Carolina shows mixed results. The data from the Annie E. Casey Foundation indicates the state ranks 33rd in the country in economic, social and health indicators for children. Lisa Philip reports on a mobile dentist clinic that treats low-income students in rural North Carolina. On a recent morning, two third-graders from New Hanover County get their teeth cleaned and examined in the dentist's office that's parked next to a dumpster, under a stand of pine trees behind their school. The mobile clinic was at another school the day before.